For comparison, they almost have the same color. 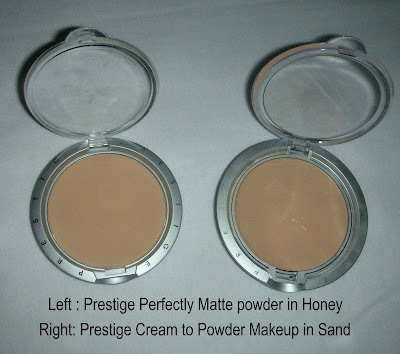 To read my review on Prestige's Touchtone Cream to Powder Makeup, click here. Light, translucent coverage. Fine-textured for a natural, even finish. Perfectly matte, smooth finish. 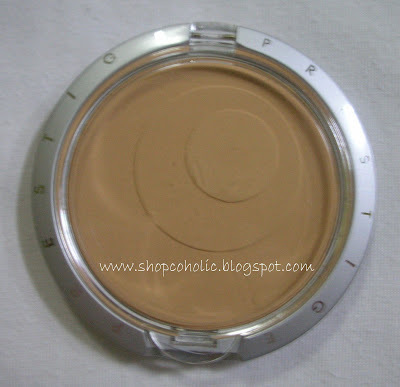 Handy to carry for touch-up, pressed powder can also be used to set makeup. Oil free and oil absorbent. Long wearing formula. * doesn't cake - perfect for retouching! If you're looking for an inexpensive powder and wants a sheer coverage, I highly recommend this! I also wanna try their Wet/Dry Foundation next.. Still waiting for their next sale! i love the packaging its so simple.when kaya next sale nila? I've seen them around , thanks for the review! Nc-15-20 thanks for the addtional info. i dont know my mac equivalent. went to BTC this afternoon. u might wanna check the store calles CHAINS. they have some beauty treats, wild and crazy, La colors and other japanes cosmetics,.